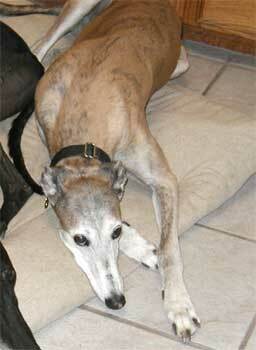 Pippa, aka Pat C What Ever, is a 7-year-old beautiful blue brindle female, born September 21, 1996. Her sire is Pat C What's On and her dam is Pat C Moncheri. 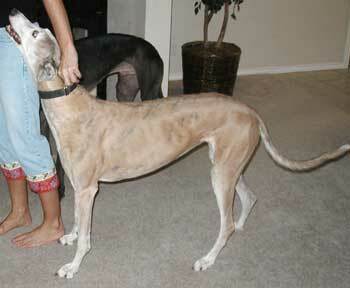 Pippa raced at Pueblo, Colorado track from January 6, 2001 to November 10, 2001. She was adopted in January 2002 to a family who lived in Washington state. Pippa has been in this home for almost two years with Matrix and they get along really well with each other. After a move to Texas from Washington earlier this year, their family was just not able to keep them. Both Pippa and Matrix have been in a home with older children (10 & 13) and did excellent with them. Pippa is pretty laid back and very loving and sweet. Pippa is not cat or small animal tolerant. GALT would like to be able to place Pippa and Matrix together if at all possible, or at the very least place each in homes with other greyhounds.